Walk into Columbia’s Museum of Art and Archaeology between now and Aug. 11, and you’ll find some pretty intense, large-scale woodcut prints depicting rural Missouri life staring back at you. In one print, naked women straddle a monster truck. Another depicts a brother and sister getting married to each other. One print has an entire town going berserk with excitement over the opening of a fast-food chain restaurant, and in another, customers at a shop try on a used denture... and put it back on the shelf. 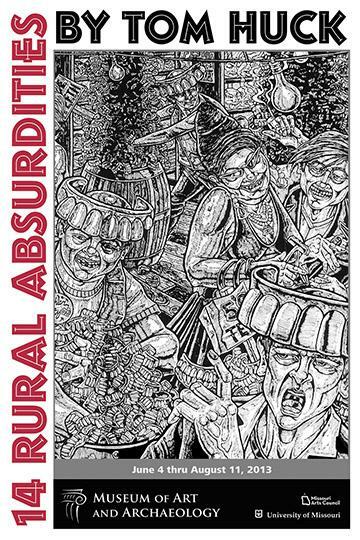 “2 Weeks in August: 14 Rural Absurdities” is the satirical work of the Missouri artist Tom Huck, which he says is inspired by growing up in rural Potosi. Huck's designs are dense and intricate. He fills every inch of his woodcut with a narrative detail. Every print is so rich, it can be overwhelming at first sight. Museum of Art and Archaeology Director Alex Barker says making such detailed design on woodcut is “enormously hard” to achieve. Barker says there's almost a brutal frankness in how Huck's prints depicts rural life in Missouri. “But at the same time, there's an element of absurdity that allows us to identify with them, without necessarily finding them foreign,” Barker said. I spoke to two women from the Missouri Ozarks to see what they thought of Huck's depiction of rural life. Folklorist and rural Missourian Rachel Reynolds Luster says she's a fan. She works and lives in Oregon County, just north of the Arkansas border. Also a woodcut enthusiast, Luster said she found Huck's techniques fascinating when juxtaposed with the subject matter. Marideth Sisco of West Plains and Winter's Bone fame said Huck's series made her sad. “I looked hard for kindness in his art, but I didn’t see it,” Sisco said. But Luster says she appreciates how Huck’s work challenges idyllic perceptions of rural life. To view the prints, click here. This week, a sweet story from a library in Oregon County, just north of the Missouri-Arkansas state line. 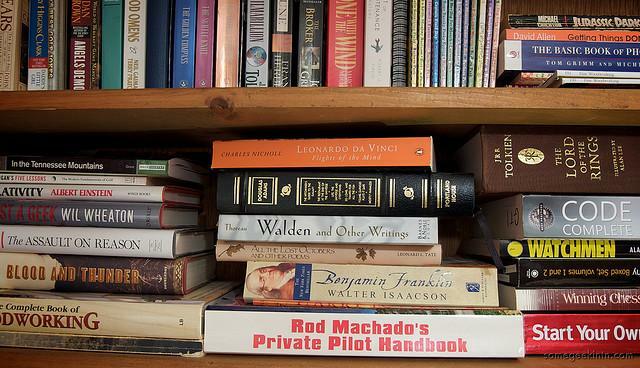 Rachel Reynolds Luster is the librarian at the cozy, one-room library in Myrtle, Missouri: population around 150. There’s one gas station and a small post office, but no grocery store or bank. Upon reporting to work on day one, she realized there was going to be one major challenge: there were hardly any modern books.